Friday (I played hooky at work) and Saturday were beautiful, sunny days to hit up our local farmer’s markets, where I picked up peaches, blueberries, summer squash, pickling cucumbers (I made another batch of Spicy Refrigerated Dill Pickles), a Papadew pepper, and some flash-frozen Pacific Cod from the beautiful Oregon coast. I did find some tomatillos that I wanted , but they were very small so bought other ones at the local store (I made chicken enchiladas with Fire-Roasted Tomatillo Sauce). My mom also picked up a banana chocolate chip bread, which by all accounts was delicious. The original recipe called for 6 to 8 peaches, but 3 rather large ones fit the small, shallow pie pan I had. Place the flour, sugar and salt in a mixing bowl, then add the oil and milk and mix with a fork until well combined. Press into a shallow pie or tart pan with your fingers. Set aside. Preheat the oven to 425 degrees and line a sheet pan with parchment paper. Arrange the peaches in the pan around the sides and pour the blueberries in the middle. Place on the parchment-lined baking sheet (in case of drips). Mix all ingredients in a bowl with your hands until it resembles fine crumbs. Distribute the crumbs on top of the tart and bake until golden brown and bubbly, about 45 minutes. Ouch sorry to hear about your arm. I remember the sharp puppy teeth and nails well. The pie looks amazing and your beautiful Mom is a great model. Thank you so much for making it it’s gorgeous. Looks great, Kathryn. When I get my oven fixed, I’m going to make that! Cute photo of your mom 🙂 And sorry to hear about your arm. Enjoy the visit with family. It sounds like you’re having fun! Thank you so much Lynn, I love my momma! Thank you Lynn, I sure will! Yes, I posted about when they broke their backs while visiting last time. Yes I thought there was a huge issue! So glad they are well! What a gorgoues looking pie. I saw it on Suzanne’s blog and it looked real good. Get better soon and enjoy your parents visit. I fell in love with this pie when I first saw it on Suzanne’s site, you did great. Love this combination. Have fun with your parents! So did I, thanks so much Cheri! Ouch, Kathryn. Shame on the groomers for neglecting something important. I hope it heals quickly. 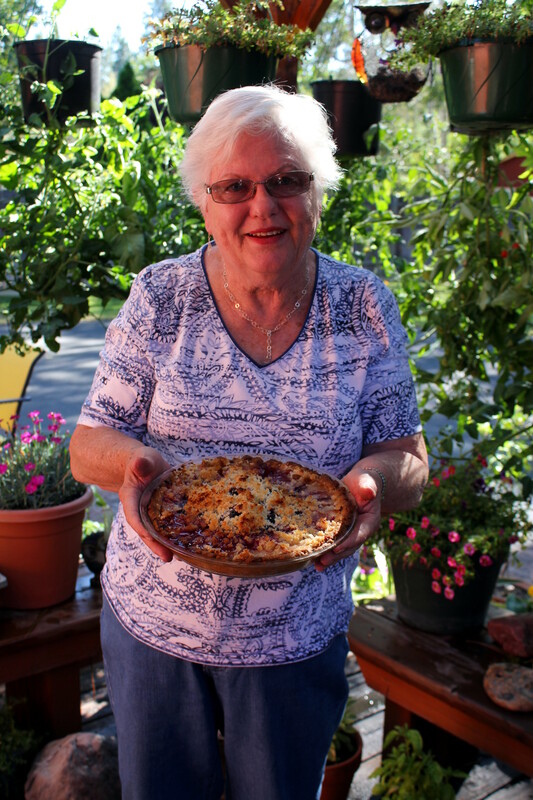 The tart looks delicious, and your mom is a lovely model. Great pic. So charming and it sets the homey tone for your delightful post. I just haven’t been able to get caught up. I think I’m off balance from an interview on Friday (job in Las Vegas with the US Attorney’s Office). You see, I put no stock at all into this one when I set the appointment. I was sure they were just going through the motions (even more common with gov jobs than corporate, following a legal requirement to advertise broadly); I thought it was going to be a waste of time. Then it went absolutely great! But again, a perfectly lovely post from you. Huge hugs, my friend. That looks divine Kathryn…Perfect summer indulgence! Thanks for sharing! Your Mom makes a great model. Your tart – er, pie – looks delicious. Bet it’s all gone by now. Thank you so much Darryl. We will be eating it tonight! What a gorgeous, summery pie! I am so not good at baking, but I am definitely going to give this a try! Awww, sorry about the flood! Thank you so much, we are having a wonderful time! Thanks Gina, my mom is the real-deal Texas sweet momma, lol! Well my daughter insisted a tart has yogurt or cream at the bottom of it, but I found no indication that is so. I do know a tart only has a bottom crust but a pie can have both. Not too much more difference though. I’m so sorry about your accident & am glad you are healing. I saw Suzanne’s recipe as well. It sure looks delicious. Your mom is a great model! How sweet of you to say so Brad, thank you! Looks almost as pretty as your Mom. Your timing on this recipe is perfect. 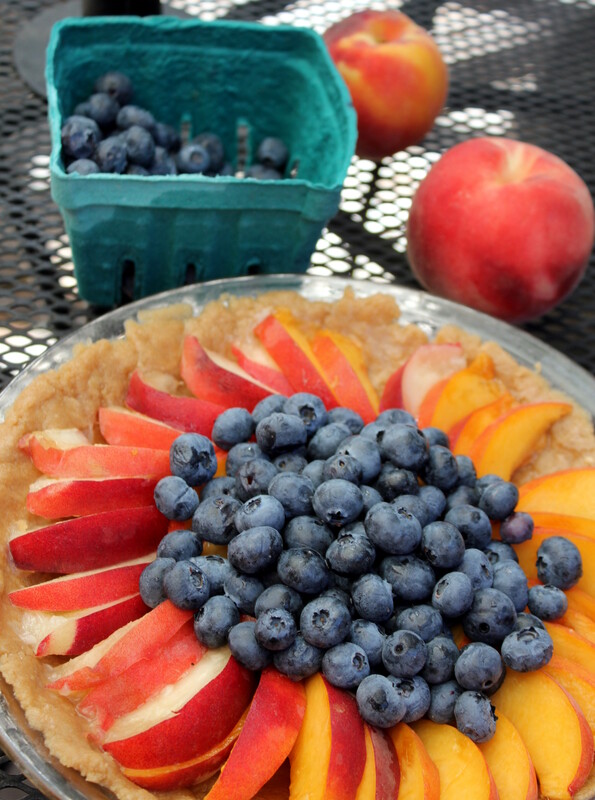 Blueberries and peaches are in abundance right now in New Jersey. I completely agree with you John! Katherine, this is a lovely tart. Beautiful shot of the fruit too. Thank you Conor, high praise indeed! This looks divine a real summer treat!! How is your arm going? Hope you feel better soon! Thank you so much Sabrina! The arm is healing up quite well, but I’ll have a bit of scarring. Kathryn – what a beautiful looking tart and that plate with the fruit – I wish I could have this here. And what a lovely picture of your Mom – such lovely smile. btw – go on looking after your poor arm. Here we wouldn’t (and couldn’t) sue for something like that, but the cliché is that Americans do. A cliché that is reinforced by tv shows of course. Still, I’m not sure I’d go back to the same groomer. Oh my gosh, KR this is gorgeous! And your Mom looks pretty happy!! 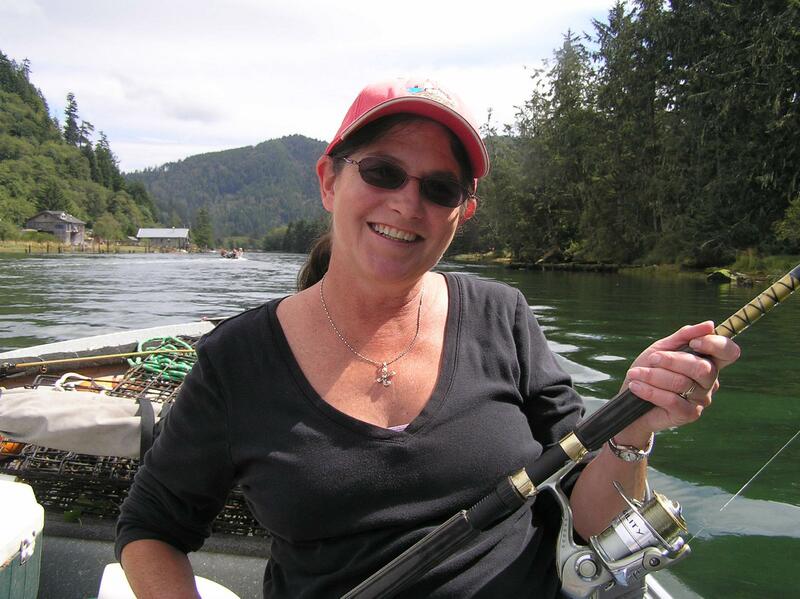 I don’t blame her – Iwas intrigued when I saw the post on Suzanne’s site, too! I always love it when you don’t have to make a top crust, lol!! Thanks Mollie, it was SO DELICIOUS! And I liked the fact it didn’t have so much thick crust. How sweet of you to say that, thank you so much! That looks so yummy and pretty. Why thank you Fabiola, I am glad you stopped by to say so! Looks so yummy! 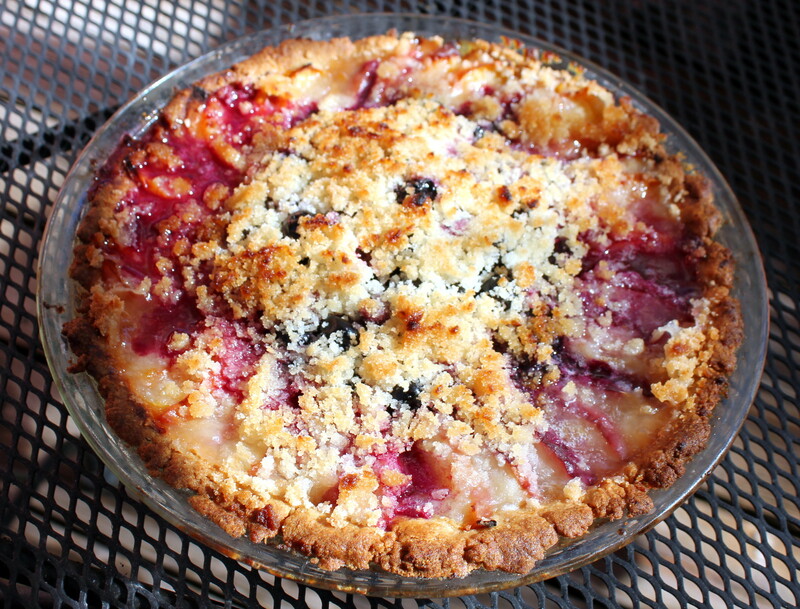 I make peach cobbler and blueberry pie…this looks like a wonderful combination! So glad you posted on Senior Salon! Yum yum,yum! I’ve been making peach crisps with the fantastic South Carolina peaches we get this time of year. Of course, I’m getting calls for strawberry rhubarb pie, which seems to be everyone’s favorite. Do you have a fool proof pastry crust recipe? I’ve tried many but never found one that was 1) easy and 2) foolproof. Gosh are you okay now? It must have hurt like crazy! So nice that you are spending time with your parents 🙂 That pie looks absolutely delicious! My arm is healing up quite nicely, thank you for asking. And yes, the pie was delicious! My arm is healing up quite nice, but I do believe I might have some scarring. Thank you! Oh! This looks great! My husband loves pie! Thanks, you should make him one! I am! Normally I am a basic baker and pies are not for the time challenged. But, I think this has a pat in crust, which is much easier!